I played this game by accident, and it took me about 5 levels to figure out what was going on. 5 levels later I had completed it. This is a game that I accidentally completed in 20 minutes on the first time of trying. 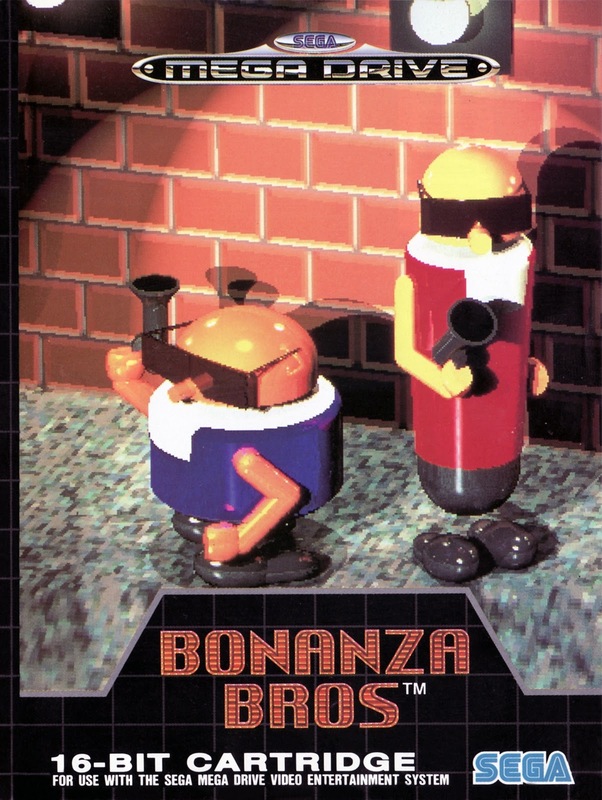 You are two brothers Mike and Spike (Robo and Mobo in non PAL regions), hence the “Bros”, and you are going around stealing stuff, hence Bonanza. In Japanese versions you’re master criminals, everywhere else you are working for the police to test home security. So Bonanza Bros is a Stealth/Run and Gun/Platformer of sorts. 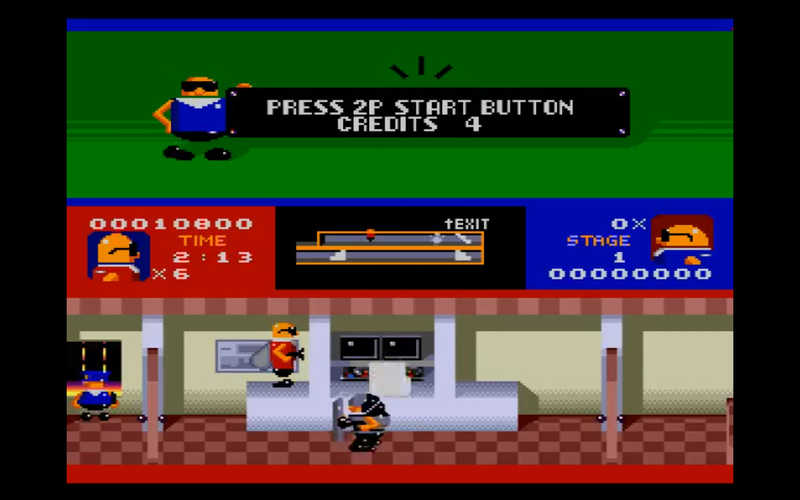 You start a level, and there is a minimap, on the map are a number of items you must collect. Out to stop you are security guards, dogs, riot police and robot butlers. Once all the items are collected and enemies avoided, you make your way to the roof where a 3rd partner is waiting ina blimp to aide your escape. The game operates on a strange multi-plane 2d platform, there is foreground and background, and you use these planes to navigate around the level trying to stealth your way past the guards. Failing that, you can shoot them. Both are perfectly adequate tactics. If you are discovered, you can hide in a different plane or use your gun to stun them, or if security guard comes to look for you you can quickly dash to a different plane. You don’t kill anyone, all guards will get back up after 5 seconds, and you can use some environmental hazards to trap the guards, for instance smacking them in the face with a door. Surprisingly this mechanic works very well, and Bonanza Bros is very fluid. The screen is odd, as it is always set to split screen, even in single player. And that is it… The game is 10 levels long, you have a 180 second time limit on each level, but most levels take less than 2 minutes. 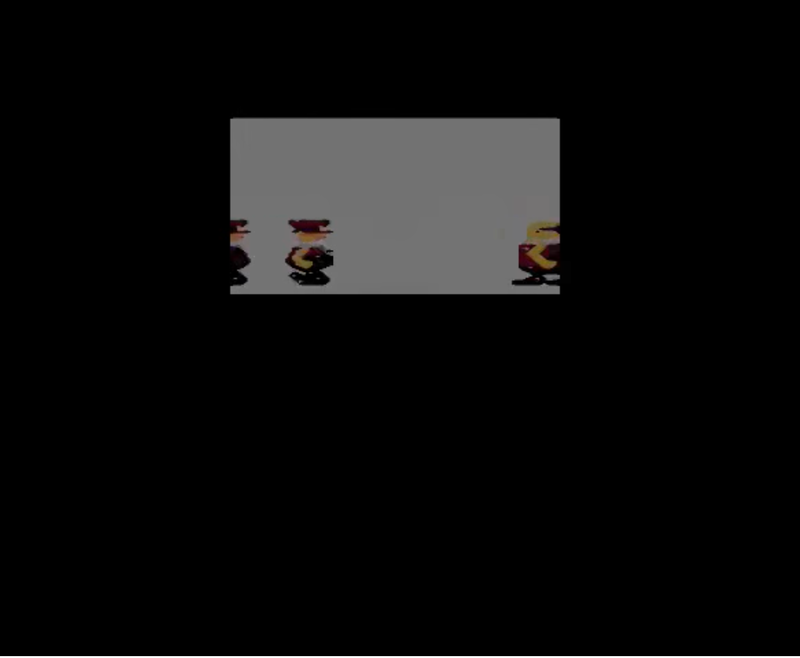 There are even attempts at cutscenes! This is basically a Benny Hill/Scooby Doo style chase scene. The game is short, the graphics are odd, and it took me half the game to realise what was happening but at the same time Bonanza Bros has a strange charm and I found it oddly fun to play. It isn’t great, but it does something simple and does it well enough. If I paid full whack for this (about £55 in UK prices in 1991) I would be bitterly disappointed. Hell If I paid the £15 for a secondhand copy on eBay I’d be a little disappointed. As it is, I discovered it on the SEGA Mega Drive: Ultimate Collection for XBOX360 by accidentally clicking “press play” instead of “view details”. Pros: Oddly charming, short, stealth works better than most modern games I have played. I can’t find any trace of this game getting a review from back in the day, but IGN gives it a 5.5 “mediocre” score. I think I saw this mentioned on Game Sack once. The art style seems a little weird! Agreed, really. I have enjoyed it in the past but if I were to be blunt I’d probably agree with that score. Yeah, it is fun, but flawed. And short. VERY short. Honestly I haven’t even played it all the way through! I’ve enjoyed what I’ve played on Mega Drive Collection on the PS3 at least. If anything, this is probably an early example of a Stealth game (though the MSX Metal Gear games pre-date this game). I kind of like odd graphics, though it looks basic compared to later Sega Mega Drive games. As for the gameplay, it’s one of those games where multiplayer is where you’re going to get most of the fun in the game nowadays. Oh god the graphics are basic as hell! Charming though. The two original Metal Gear games were ported to the PS3/Xbox 360 via Metal Gear Solid HD Collection. Oh ok. I’ll check that out then! In fact, I’ll be reviewing those two games in March, I think, got to check my schedule. Might wait then. See if it is worth my money!